Every once in a while some random little factoid will catch my attention and fire my imagination. An offhand article in a magazine, a brief story on a website, or a surprising photo – something will intrigue me and I’ll be inspired to go and hunt down an old abandoned amusement park, or search for tiny water elephants (see earlier blog entries). Recently, it happened again. 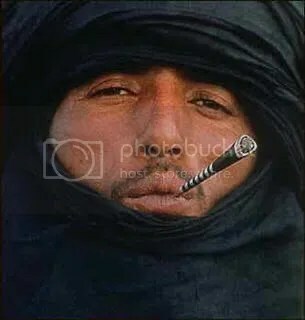 During one long afternoon at the Education Centre, when I was idly net-surfing with nothing to do, I stumbled onto a page for package tours to Libya ( its random I know, but Facebook and yahoo are blocked, and I have to look at something). I was surprised to see that there is something there, in the Libyan desert, that I had never heard, or even dreamed of. In the middle of the Sahara, one of the most barren, inhospitable places on earth, lie the remains of a mysterious civilization, now forgotten but carrying a very modern message. This civilization was known to the Greeks and Romans as Garamantes. What they called themselves we don’t know. Indeed, the Garamantians are little more than a hazy question mark hanging over history. They flourished brilliantly, slipped away into total obscurity, and are only now beginning to be rediscovered. Yet they left behind the ruins of eight large towns (only three exacavated ) thousands of kilometres from the nearest source of water, some 100,000 tombs, intriguing miniature pyramids and hundreds of kilometres of underground canals and tunnels. In the heart of the Sahara, it is clear that a great civilization bloomed. Who were these people? Seven thousand years ago, the Sahara was a very different place. 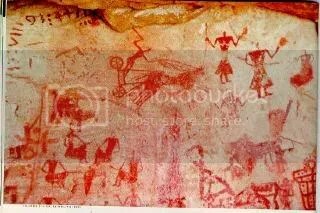 Cave paintings found in the middle of the desert show rivers and lakes, crowded with ostriches, elephants and hippopotamuses, and cavemen hunting them. Much of what is desert now was fertile country then. Some of these cave paintings, discovered in 1958, show a new people, riding in Roman or Egyptian style chariots, making war on the hunter-gatherers. These, we can guess, were the Garamantians. Where they came from (South from the Mediterranean? West from Sudan ?) we don’t know. Garamantian culture seems to have striking similarities with ancient Egypt, the chariots for one thing, the pyramids for another. They also worshiped a dog faced god, (as do the Dogon people of Mali today) and mummified their dead. In fact, a mummy recovered from the Saharan sands in Libya has been dated to 5500 years ago, older than the earliest Egyptian mummies. This suggests that perhaps the practice was transmitted from Garamantes to Egypt, not the other way around. So what happened to Garamantes? Around 2500 BC, the climate changed. The rains stopped, and the Sahara started to dry out. The lakes and rivers disappeared, and the Garamantians retreated to a rocky mountain range in today’s Southern Libya. The desert slowly swallowed up the all the land around them, until they were left on their mountain outcrop, surounded by a sea of sand. Generation by generation, they were becoming isolated, an oasis of civilization in an inhospitable land. It is here that the brilliance of Garamantes shines through. For even ringed by encroaching sands, they were able to flourish. They built a vast network of canals and wells, which pumped water out from under the Sahara, where it lay in huge subterranean chambers. This water was carried through the canals, tunnels and pipes, to water their crops. The population was fed from fertile fields of barley, wheat and figs, worked by armies of slaves. Garamantes boasted cities, palaces, tombs and forts. It also had its own alphabet, one of the few in Africa. The Garamantians were also traders. Their slaves mined for rare green gemstones in the rocky mountains (where temperatures often hover around 50 Celsius). The gems were traded North with the Roman cities in Algeria and Tunisia across the desert, with whom they enjoyed close but often turbulent relations – sometimes enemies, sometimes allies of convenience, bound together by trade. 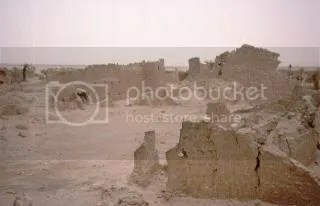 A Roman bathhouse has been found in the ruined Garamantian capital at Garama, and a Roman writer called Maternus traveled to the country, as far South as modern day Nigeria, to witness a slave raid on their Southern neighbor. But then, something happened. The wells that irrigated the desert-state started to run dry. Brilliant as they were, the Garamantians had expended all of their most precious resource, and found themselves now powerless in the face of a climate that was changing all around them. The water that had fed their fields was not a renewable resource. With no more rain, the underground lakes that fed their crops were not replenished. They had been completely used up.The irrigation system failed, the fields ran dry and there was nothing left to hold the desert back. The crops failed and the country fell, first to their greatest enemy – the Sahara – and then to the Romans. After that, mention of the civilization becomes less and less frequent, as its importance faded. One thousand years after its ascendancy began, Garamantes had all but disappeared. Finally the survivors converted to Chrisitianity it is said, and a Roman book of the era mentions as a footnote that their King was lead away in chains. But since Muslim armies swept through North Africa in 647 AD, nothing more was to be heard of Garamantes. Just silence, and the Saharan sands blowing over the ruins of their towns and cities. An amazing story, don’t you think? Garamantes vanished so completely from history that even the desert nomads who live there today know nothing about them. They had assumed that the long dry tunnels and canals were built by the Romans. Not even the legend of Garamantes had survived. Almost all that is left of Garamantes. A timely tale of caution for the modern world, if ever there was one. Will we too, crumble in the face of a changing climate? Will we squander all our natural resources, and vanish without a whisper, swallowed up by silence, just as completely as Garamantes was a thousand years ago? Who says history has to be dull? Thank you so much for posting this wonderful story! That was enlightening! That man in the picture has features similar to that of dead rap star Tupac Shakur . Tupac’s biological father Billy Garland traced his roots to this region. I want to share this on facebook how can I? Trendy device kudos with regard to placing the in place. To whom may want to know facts about Libya’s IDPs. GIVE IT A SECOND THOUGHT. Could you please give more details where one might find the story on Quran, which Surrah, and which Verse. Thank you, – the Garamantes has been on my “search list” for some time, – glad to read your input. Yes, they are an enigma. Have been looking at the Scythians the same way, – but much more of course is known, – but, same tile same importance in practically the same age. Oh yes, – history is wonderful. Herodotus did speak about a red-haired tribe of white people, but he was talking about Europe, not Africa. He only recognized the Greeks as the only white people living amongst Africans. Please re-read. The is a people call garre or ghari or garamante that you can fine it in Kenya or Ethiopia and Somalia, and they call them self garaman toubou and gouran they are traced to this region, and they know that they survived from the climate changed. The rains stopped, and the Sahara started to dry out. The lakes and rivers disappeared, and until they were left on their mountain surrounded by a sea of sand. Generation by generation, they were becoming isolated, an oasis of civilization in an inhospitable land, and some they left to Ethiopia and Kenya and Somalia and i am one of them. WE call that time KIDIGURAI.